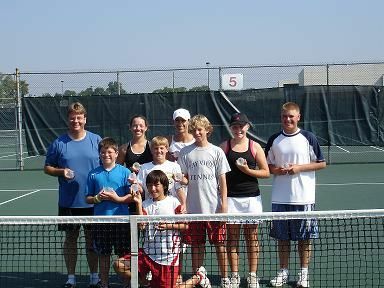 1)	In a rematch of last year’s semifinal vs Dayton KTC team, the Tweeners found themselves down 22-14 with two mixed doubles matches to play. They needed to go 12-3 or better, with Josh Cogan and Rachel Allen and Elissa Halla and Phillip Kuenzi taking the court. As I have said the last two years, the Tweeners best shot was to do well in mixed doubles….and the kids came up with the goods taking the matches 6-0 and 6-2 to complete an amazing come from behind win, 26-24!! Plenty kids AND parents went wild, with tears being shed by many. A moment to remember for the rest of our lives. 2)	In today’s final vs a team from Michigan, the kids also went into mixed doubles needing to play well, holding a slim 19-18 lead. Rachel Allen and Matt Zellner calmly walked on the court and put up a huge 6-0 win, clinching the Championship just as Elissa and Josh were starting the final match. The final score was 31-23, with mixed doubles proving the decider once again. All of the kids played some of their best matches when they counted the most today. 3)	Over 6 matches this weekend, the kids went 32-4 in sets. They were 23-1 in all doubles/mixed doubles, and a perfect 12-0 in mixed doubles. They definitely showed the Midwest they were the best doubles players in Indy this weekend. It was neat to see them beat some highly ranked, top 100 Midwest players, by simply playing better as a true team. They also laid claim to the highest win percentage in the competition based on the strength of their doubles play. 4)	The kids went a perfect 5-0 in tiebreaks during the 3 day event, showing how tough they are on the big points. They went 10-1 in sets decided by two games or less. 5)	The kids got some publicity for their name and favorite shot, as did Nick for his nation leading team tennis win streak. See this link for more information. By the way, Nick upped his unbeaten streak to 33 matches, including a nail baiting tiebreak win in one of his matches. 6)	The Tweeners were the only champions from the Wisconsin District this year, with two other teams taking 2nd place in 14s Intermediate (Fondy Futures) and 12s Intermediate (Western Whompers). Perhaps those teams can step up and continue in the Tweeners’ place next year as the Tweeners look to move on to 18s. Special kudos to Elissa Halla for being willing to report a week late to Roncalli, to Phillip Kuenzi for choosing to play with the Tweeners instead of playing in his Marching Band at State Fair and for Matt Zellner coming up with the goods this morning, shortly after losing his goods in the wee hours of the night after something from dinner didn’t sit well with him. And double special kudos to all those parents who were cheering the kids on for 3 straight days. I believe their support was instrumental in the way the kids played in the championship round matches, in particular the startling come back against the same club that knocked the kids out last year. Finally, special thanks to Tony Daharsh and Tate Whitlinger for all the doubles work with the kids over the last 18 months. You would have been proud of the Tweeners this weekend. To view results from the championship weekend, visit the following link. Then select the following options: Championship year-2006, Level-Section, Section-Midwest, and then select the various divisions and flights for results. Those not pictured did not take part in the Sectional Championships, but are part of the team that will be traveling to National Championships in October.